It was early November here in Southern Ohio and my scouting had paid off. I found a big active scrape down in the thick cover below the spillway of a pond. I then began to formulate my game plan. I was hoping the big non-typical buck I was hunting was hiding in a bedding area close to the water source. He would get up, circle downwind of the pond, get a drink, and then drop down the spillway to check the big scrape. At that point, all I needed him to do was to choose the right trail out of the cover and I would get my chance. Normally that would’ve been about the time I started the process of picking out the tree for my stand. The only problem was that this farm was hit hard by a tornado the previous spring. All the trees I used to hunt from went from vertical to horizontal in one afternoon. This tragic fact had forced me to get out of my comfort zone. I had to abandon the treestand and start hunting from the ground. I thought about using pop-up blinds but I only had one and couldn’t really afford to purchase the number I would need to adequately cover this farm. I was also not interested in having to move my one and only blind all the time. Besides, I prefer to set them up, brush them in, and leave them there to let the animals get used to them. My next idea was to try a ghillie suit. So I shopped around and found a relatively inexpensive suit online. That purchase gave me an entirely new perspective on hunting whitetails here in the Midwest. 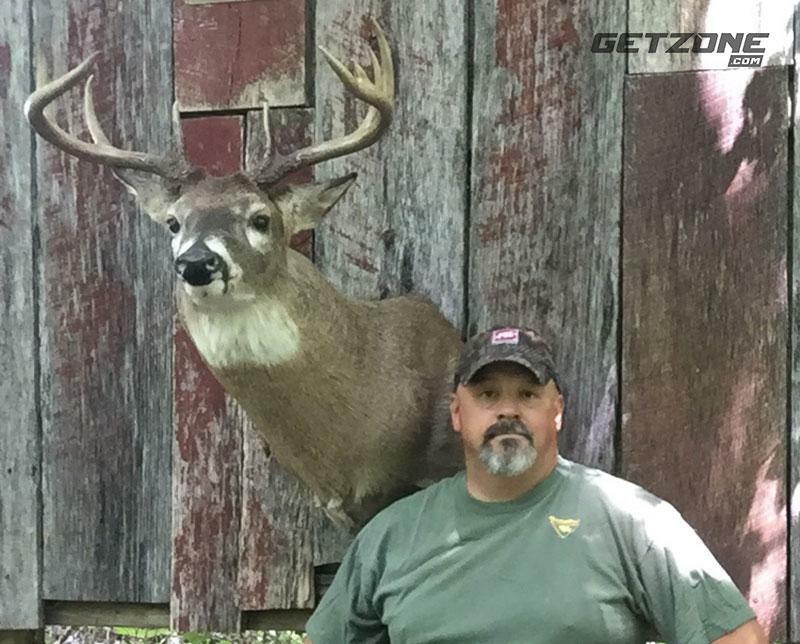 Below are the 5 key things I have learned about bowhunting whitetails from the ground. The first thing I learned and have already mentioned is the need for some form of 3-dimensional camouflage. It’s not impossible to go unseen in basic 2-dimensional camo’s but adding that extra 3D element really makes a big difference. Let’s go back to that spot I discovered below the spillway of the pond. I picked a tree that was broken off by the tornado to lean up against. I made sure there was plenty of cover behind me and my 8-foot stump. I waited for an afternoon with a north wind, packed up the ghillie suit and headed for my new spot. I am not afraid to admit I was not feeling very confident, but I had no choice. I quietly got into position, donned my new ghillie suit and set my focus on the thicket containing the big scrape. The ghillie suit hides the human outline and takes advantage of a deer’s lack of visual acuity. Notice the frame to an old gate on the left-hand side of the picture. Old fence rows can offer great cover. What I didn’t count on was the big ole’ doe that wanted to go in the cover the way I wanted Mr. Big exit. As she was headed in my direction I remember thinking, “Great! She is going to come down here, and foil my well-conceived plan.” If you spend enough time in the deer woods you quickly learn those matriarchal does are hard to fool. The doe kept working her way in, getting closer and closer. In the back of my mind, I knew it was only a matter of time before she would begin her ritual combination of stomping and blowing alerting all local wildlife to my presence. Now, I’ve been hunting whitetail deer for over two decades and in that time I’ve learned a lot from my successes and failures. One of the things I have learned is that bowhunting whitetails from the ground is tough! When you get down on their level the scales tip a little more in their favor. When that big ole’ girl closed to within 8 yards of me while I was standing there leaning against a tree, I thought I was toast. She stopped, raised her head and began to act a little skittish. “She’s on to me.” I thought to myself. That was when she scanned the area and looked right through me. I couldn’t believe it. I felt like the invisible man! She slipped into the thicket below the spillway, none the wiser to my presence. I realized that one deer doesn’t necessarily prove anything. I needed more data. About 30 minutes after the doe went by; I heard that sound that gets any bowhunter’s heart thumping. A deep guttural “Brrruuup” came from the thicket. I thought “Oh this is it, that big non-typical is walking right in to kill box alpha!” That’s when a handsome four-year-old 10 pointer stepped out. I was at full draw as he entered my shooting lane. My heart sank when I didn’t see that drop tine and split brow of the buck I was looking for. It was hard to do, but I let that buck walk. The point is he didn’t see me either. 18 yards away and he had no idea I had the drop on him. Notice the field in the background. This spot puts me close to a gap in the fence row I’m using for cover. If the wind is right any deer using that gap to enter or exit the field will come right by me. My confidence level in the ghillie suit was steadily increasing. It takes advantage of the biggest weakness in a deer’s defenses, their visual acuity. Basically how sharply they see detail. Without getting too anatomical, we mammals see with two kinds of light receptors on our retinas. They are called the rods and cones. The rods help us see in the dark; the cones give us color and detail. Deer sacrifice sharpness or visual acuity for low light visibility. They have a lower concentration of cones then we do, but a higher number of rods. Simply put, they can see in the dark but we can see and read the letters in this print, and they can’t. The ghillie suit hides the human outline and makes it very difficult for a deer to see us. It’s not foolproof though. You can’t stand in the middle of a cut cornfield and go unseen, but if you tuck into some cover and stay still, they will have a very tough time picking you out. Another must with the ghillie suit is you have to practice shooting your bow while wearing the suit. There is a lot of stuff hanging from it that can interfere with the bowstring. You may find, as I did, that the fabric on your bow arm may need some trimming. It could interfere with the bowstring and alter your shot. The second item on the list is what I call a good ground hunting bow. So, what is a ground hunting bow? 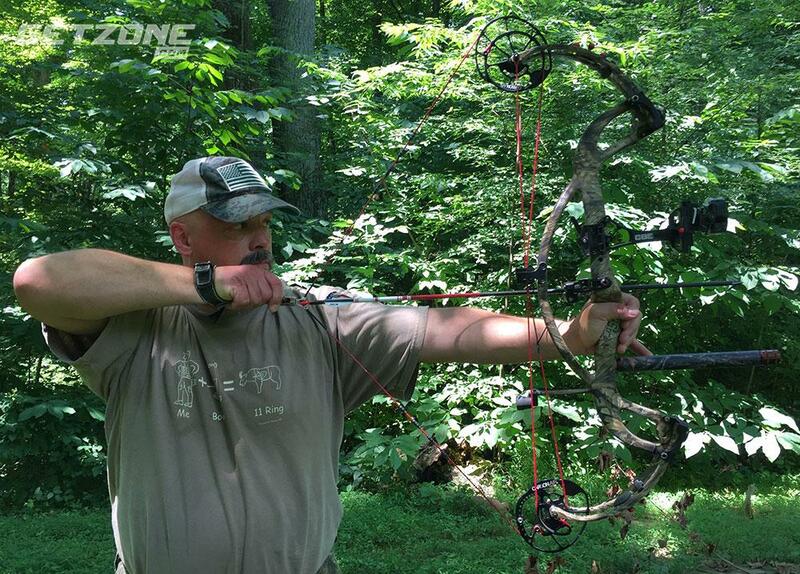 Chances are whatever bow you are using to hunt with from a tree will work, but it needs to have two key characteristics. It needs to be compact and easy to draw. Both of these are relative to the particular archer. For example, Dwayne “The Rock” Johnson could probably get away with using a longer, heavier drawing bow than the one needed by the famous jockey Willie Shoemaker. Since we are all different in size, strength, and stature, here is what to look for. Can you sit on the ground, hold and shoot the bow without the bottom cam hitting the ground? If so, the bow is compact enough. Obviously, if you choose to hunt to from a stool or chair you can use a bow with a longer axle to axle length. With the current trend in bows getting shorter and shorter most of the hunting bows out there will easily meet this requirement. I am 5’10” and I can do this with any bow shorter than 35″ axle to axle. The second and probably most important feature of the bow is its draw weight. Any experienced bowhunter knows that drawing on a live animal can be tricky. The difficulty level goes way up when you are down at eye level, so you need a bow with a draw weight low enough to draw easily and smoothly. For me, that is a bow somewhere in the 60 to 65-pound range. I could use a 70-pound bow but with the speed of the bows, they are making today I don’t need that extra 5 pounds of draw weight. 2016 buck Eric took from the ground at 14 yards. He came right down the logging road cruising for does. He was on my hit list for two seasons and was my first 20’” wide buck. Here is how I recommend testing the draw weight of your bow. Hold it out at arm’s length with your pins on target. Draw the bow while keeping your bow arm still and level, holding the pins on target as best as you can. If you have to raise the bow over your head or wave it back and forth to get it back to full draw, then you need to turn down the poundage. You will never get away with that much movement down on the ground. If you do then I want to hunt the deer you are hunting. If you can’t draw your bow in the manner I have described, and are dead set on your current draw weight, then I recommend you hit the weight room or prepare yourself for a lot of disappointment. 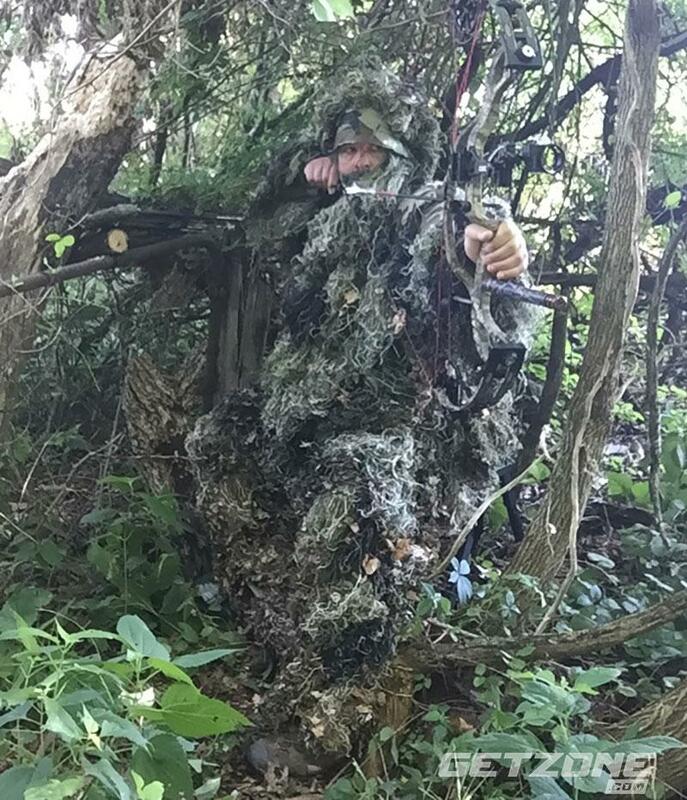 After you’ve obtained the ghillie suit and the bow the next thing to consider is a comfortable place to sit. My first few times out I stood and leaned against a tree. Needless to say, I would quickly get tired and uncomfortable. This would lead to me shifting, fidgeting and in general moving around too much. The same thing happens when I sit directly on the ground. Plus, sitting that low can limit my visibility. So I decided to hunt from a stool. In an attempt to save a few bucks I picked up cheap little tripod stool. It was easy to pack in, not so easy to sit on for very long. It too was uncomfortable and the end result was the same, too much movement. That’s when I decided to invest in a good stool. Now I’m not here to sell stools but I found one that is a good compromise between packability and comfort. It is made by Redneck Outdoors. 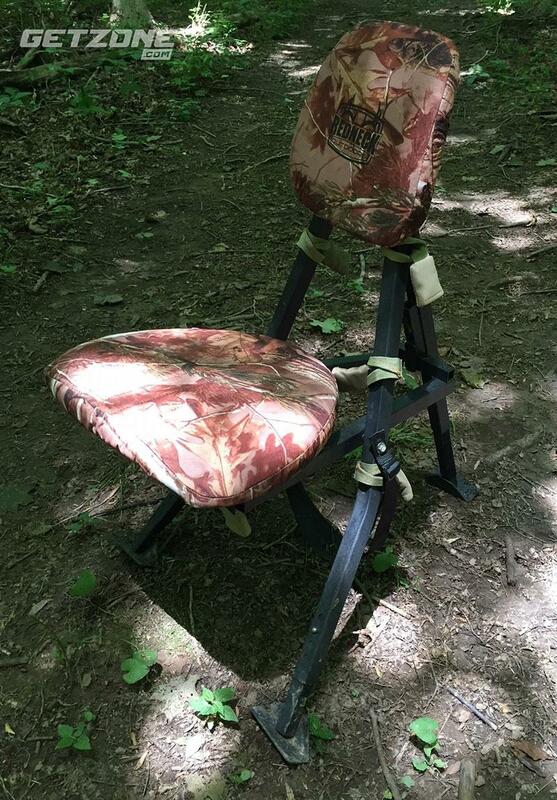 It’s comfortable enough for those long sits, folds up nicely for easy packing and costs about the same as most good treestands. It has a good backrest and a seat that allows me to pivot 180 degrees. I can adjust the length of the legs to sit up straight or tilted slightly back to lean more on the backrest. The leg adjustments come in handy on uneven terrain as well. There are lots of good stools on the market so just like your bow; you need to find the one that works best for you. My seat of choice is the portable hunting chair from Redneck Outdoors. The backrest and swivel seat are the two key features of this stool that make it worth the money. Here is the folded chair with the Leech bungee corded to the back. My ghillie suit is in the camo bag strapped in the bedroll pocket on the bottom of the Leech bag. 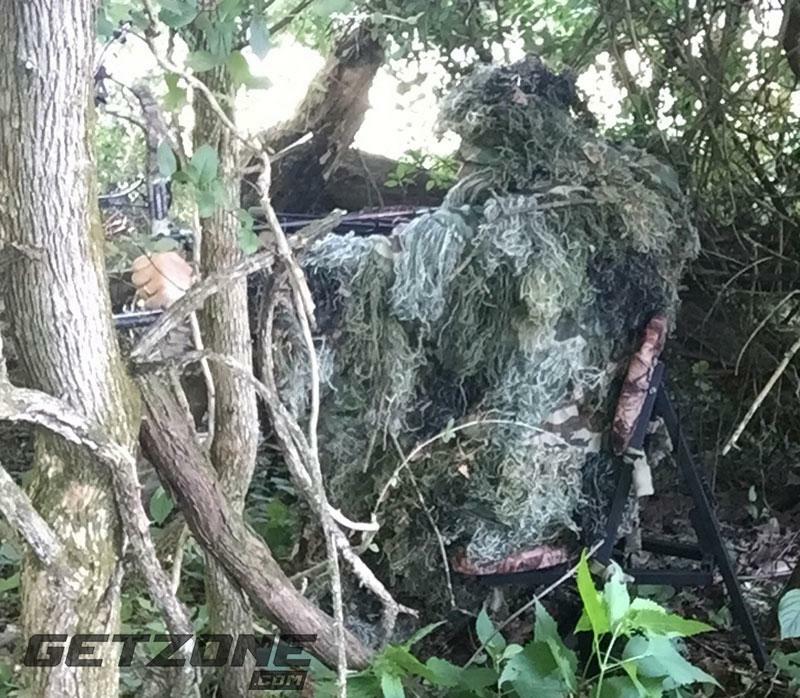 Now that you have a ghillie suit, ground bow, and a good stool, you now need a good system. Here’s what I mean. 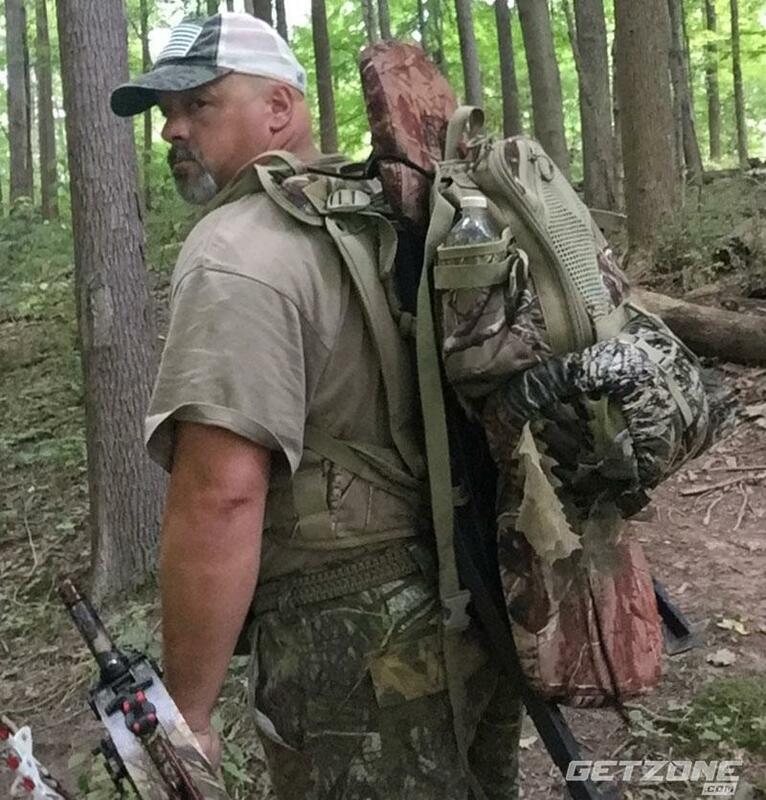 A good system allows you to easily pack in your, gear, stool, and ghillie suit, set up quickly and be able to pack it all up again when the hunt is over. I can speak from experience why a good system is important. If it’s a pain to do, you will quickly tire of it and not do it anymore. I have a great climbing stand that is wonderful to hunt from but is a serious pain to pack in and out. It’s heavy, bulky, and it takes time to set up. That’s why it usually stays in my garage. It may take some trial and error but once you get your system figured out it will be worth the effort. My system allows me to pack in my stool using the Gameplan Gear TTS. It was designed to pack in treestands but works great on my stool. I carry my gear in a bag also made by Gameplan Gear, called the Leech. It has built-in bungee cords that allow me to strap it to the stool. 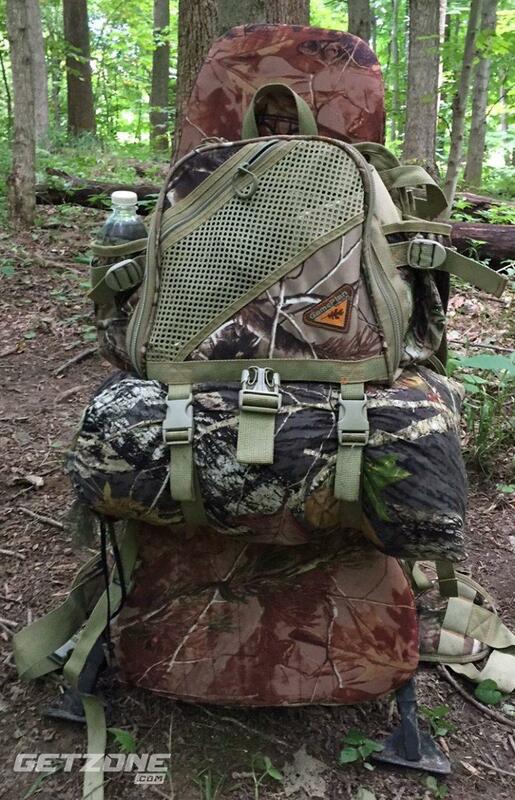 This setup enables me to comfortably pack in the stool and all my normal hunting gear. The entire unit weighs less than many big climbing treestand and is less cumbersome to pack in. When all put back together with my stool, with backpack straps, and pack make a convenient and easy to use system. Ok, you now have the ghillie suit, the bow, the stool, and a good system. You now need the most important piece of the puzzle, the setup. The two things the perfect set up needs is good cover and the right wind. The wind is out of our control but is the most important part of the setup. When you are down on the ground you absolutely have to play the wind. This is an ironclad, do not break, must follow law. I’ve used various scent free soaps, detergents, deodorants, cover scents, and Ozone generators. If I hunt a perfect spot in a bad wind I get busted. I promise, they will smell you and if they do, it won’t matter what kind of camo you are wearing, the stool you’re sitting on, or the bow in your hand. You absolutely have to play the wind! Ok, now that we have that settled, let’s talk about cover. Scouting is obviously still important. Finding funnels, rub lines, bedding areas, food sources etc. is the name of the game, but now instead of picking the tree close to the sign, you’ll need to analyze the ground cover. Here in southern Ohio, there are certain things almost every property contains that make great cover. Fence rows, honeysuckle and cedar trees. Sometimes I can find all three together. If I get lucky enough to have all three close to good sign, that will be my spot. I tuck in, trim a few lanes and wait for the right wind. I also will place the branches I cut for my shooting lanes in front of me to add cover to my set up. One of my favorite ground spots is where logging road crosses an old fence row. The deer walk that logging road pretty regularly. But I can only hunt it in the morning with the wind coming out of the south. No, if, and’s, or buts! I tuck in the fencerow north of the logging road. This puts me downwind of it and allows me to get between the deer and their bedding area. If I try that spot in the afternoon with the wind out of the south it blows my scent into the bedding area, that’s never good. East or west wind carries my scent either up or down the logging road, also not good. I have taken a handful of does, and a 20″ wide 4-year-old 9 pointer from that spot, and all of them in the morning, with you, guessed it, the wind out of the south. Is bowhunting whitetails from the ground my new favorite way to hunt? Yes and no, if I have a choice I will pick a treestand 9 times out of 10. But thanks to Mother Nature making me get out of the tree and down on the ground, I am now more confident in my chances of success. Not to mention, being down eye to eye with a mature whitetail is a rush worth experiencing. So if you’re looking for a new challenge or the place you hunt got smacked by a tornado, hopefully, you can use these 5 tips to help you bag this year’s buck from the ground. Good luck and I’ll see you in the deer woods.